That will do from me. Thanks for your company this afternoon. We'll be back for Scotland v Poland on Thursday. That is a massive match. Defeat at Hampden and the Euro 2016 dream is over. Mae sure you join us for that one. Cheers. You can see all of the goals and talking points on Sportscene at 22:30 tonight on BBC One Scotland. Online highlights of Saturday's games will be available from 18:00 but you'll need to wait until midnight for today's match. That's the weekend action complete in the Premiership and the headline news is that Celtic are just a point behind leaders Aberdeen, who were thumped at home by St Johnstone yesterday. Dundee United prop up the table after their defeat at Firhill and Inverness CT enjoyed a derby win at Victoria Park. The BBC Radio Scotland team are busy talking about the merits of synthetic pitches. Derek Ferguson thinks the surface at New Douglas Park is one of the better ones but concedes there are a few in Scotland that are not up to scratch. Big Pat Bonner doesn't like them at all. "It was just about hard work, staying in it to get the three points. We were a little bit lucky but we've been unlucky this season against Hearts, Kilmarnock and maybe Aberdeen. That's four times in a row that we've taken three points after Europe this season and that's good. "The players are slipping all the time on this surface. I'm a fan of artificial pitches but there is something not right." "We're disappointed we didn't take something. I thought we dominated most of the second half. We had lots of half-opportunities, without really creating a good chance. We've made a terrific start to the season and there are more positives to build on." It was a pretty special header from Leigh Griffiths for the winning goal today and it was his whipped free-kick that led to Dedryk Boyata's equaliser. I'm sure Scotland manager Gordon Strachan will be impressed but will it be enough to earn him a place in the starting line-up against Poland on Thursday? "[On his prospects of playing for Scotland on Thursday] Chris Martin, Steven Fletcher and Jordan Rhodes all scored yesterday, so I needed to score today." Hamilton battled away and got off to a wonderful start when Gramoz Kurtaj found the net with a lovely strike but they struggled to create openings after that and their long unbeaten record at home is gone. That's the first defeat on their own patch since 15 February. It wasn't pretty but Celtic got the job done and they move to within a point of Premiership leaders Aberdeen. Celtic replacement Gary Mackay-Steven speeds away from Jesus Garcia Tena before lashing an angled strike inches wide of the far stick. Four minutes of stoppage-time is signalled and play is stretched as Hamilton push men forward in search of an equaliser. More daftness as Emilio Izaguirre squares up to Lucas Tagliapietra and gets a shove in the chest. The Hamilton defender is taking a risk doing that in his own penalty area but play goes on after another ticking off from referee Steven McLean. Kris Commons loses his footing again as Nir Bitton leads a breakaway for Celtic and floats an inviting cross into the path of his team-mate only to see him on his backside in the penalty box. Hamilton midfielder Dougie Imrie has run his race and we'll get a look at the Brazilian with the French name, who made his name in Greece - Alexandre D'Acol. We're into the 80th minute and this game is still finely balanced. The second half has been very scrappy, with both sides giving the ball away far too often and lots and lots of fouls. Celtic playmaker Kris Commons slips as he rushes in to meet a dipping delivery from Emilio Izaguirre and the ball pops up nicely for goalkeeper Michael McGovern. More changes, with Greg Docherty replacing Ali Crawford for the hosts, while Celtic bring on Gary Mackay-Steven and Mikael Lustig, with Tom Rogic and Saidy Janko going off. Hamilton bring on some serious muscle in the shape of striker Christian Nade. Carlton Morris is the man making way. Another trip. Another free-kick. Jesus Garcia Tena's effort clips the defensive wall and goes out for a corner, which, in turn, is met on the volley by Dougie Imrie and lands in another post code. Celtic make a change as James Forrest trots off to be replaced by Stuart Armstrong. That's how to respond to a know-nothing text commentator! Ali Crawford curls a peach of a shot towards the far top corner and Craig Gordon makes a great leaping save to claw it away. The ball falls to Carlton Morris a few yards out and the striker can only knock his first-time effort wide. I was building Ali Crawford up before the game but the Accies midfielder is having a stinker and he's lucky to escape a booking for a daft trip on Emilio Izaguirre. A dreadful pass from Ali Crawford sets Celtic off on a swift counter-attack, which ends with Tom Rogic slipping a pass to Kris Commons who can only slice a shot wide when he should be making the keeper work from there. The foul count is really rising as it all gets a bit niggly and silly. Accies defender Jesus Garcia Tena is booked for a trip on James Forrest. Celtic continue to look the slicker side as Leigh Griffiths slips in a pass for Tom Rogic and home keeper Michael McGovern fumbles the Australian's shot before gathering at the second attempt. That's better from Grant Gillespie as his half-volley from 25 yards zips narrowly past the post, with keeper Craig Gordon at full-stretch. The fouls keep coming as Grant Gillespie, already on a booking, careens into Kris Commons, who has had a quiet day so far. From the free-kick, Michael McGovern saves well from a Nir Bitton header but the Celtic midfielder was caught offside by the hosts' high line. Now we have Ziggy Gordon and Nir Bitton clattering into each other as the Celtic man catches the stooping Accies defender on the head with a raised foot. Some early argy-bargey for referee Steven McLean to deal with as he defuses a heated exchange between Dougie Imrie and Emilio Izaguirre. We're up and running again. No changes in personnel. As the teams emerge for the second half, home fans will want to see more from Dougie Imrie and Ali Crawford in the middle of the park. There are sure to be a few more thrills and spills after the interval. Can Celtic secure the victory and close to within a point of Premiership leaders Aberdeen? Tim Alloy on Twitter: "#bbcscotfootball Celtic have the best defensive record in the league. Perspective please guys." It's been lively and both defences have been far from convincing. Gramoz Kurtaj shot Accies ahead but the visitors hit back with goals from Dedryk Boyata and Leigh Griffiths. A good Superman impression from Celtic goalie Craig Gordon as he comes flying out to punch a Dougie Imrie free-kick. Problem is, he's nowhere near the ball. Luckily for him, it zips a few feet wide of the back post. Grant Gillespie is cautioned for a late challenge on Nir Bitton. The Celtic player was caught on the end of his toes as he pinged away a pass. Ouch! That was a fantastic header from Leigh Griffiths for Celtic's second goal. He's a lot smaller than the Accies central defenders but he was up like a salmon on a pogo stick! Is he the man to lead Scotland's attack for Thursday's crunch meeting with Poland? Celtic full-back Saidy Janko is the first man to have his name taken by referee Steven McLean for grabbing a fistful of Gramoz Kurtaj's jersey. Celtic are swarming forward now and Michael McGovern needs to make a good save to keep out a shot from James Forrest. Suddenly, Celtic are ahead as Leigh Griffiths rises impressively to meet a deflected cross from Saidy Janko and nods the ball high into the net with real precision. That's goal number 12 for the season for the striker. Celtic are level as Leigh Griffiths swings in a free-kick from the right and Dedryk Boyata makes amends for his role in the opening goal by side-footing home from close range at the back post. "Hamilton are keeping their shape and discipline well. They are happy to give Celtic possession in their own half. Celtic are maybe trying to be too precise. They might be better off going long and getting the ball up the park quicker." Norwich boss Alex Neil is a guest at his former club today. He is sure to be heartened by Accies's start.Image caption: Norwich boss Alex Neil is a guest at his former club today. He is sure to be heartened by Accies's start. Celtic look decidedly wobbly at the back as a poked shot from Ali Crawford takes a deflection and goes out for a corner. The set-piece lands for Ziggy Gordon at the back post but the stretching full-back can't get the correct contact on the ball. Nir Bitton has another pop from 25 yards or so and once again the Celtic midfield is off target. Accies won't want to give the tall Israel international too many more opportunities like that because he does find the top corner every now and again. Accies are playing like terriers, snapping into challenges and not giving Celtic a moment to settle on the ball. The home fans are loving what they've seen so far. This game is wide open as Celtic midfielder Nir Bitton lets fly with a shot only to drag his effort wide. The hosts are ahead as a long bouncing ball has the visitors in all sorts of trouble. Tyler Blackett misses a header and Dedryk Boyata is outmuscled by Gramoz Kurtaj, who runs on to expertly slot the ball across goalkeeper Craig Gordon and into the corner of the net. Celtic bossing the ball in the opening minutes and a defensive slip allows Leigh Griffiths to sneak in but his shot from a very tight angle is smothered by goalkeeper Michael McGovern. And we're off. Celtic in their all-green change kit to avoid a clash with the hosts' red and white hoops. Of course, Accies did beat the champions last season, going top of the league with a 1-0 success at Celtic Park in October. Ali Crawford was on target that day and the flame-haired midfielder has been impressive so far in this campaign, finding the net three times. Celtic have won on five of their previous six league visits to this part of North Lanarkshire. The last time there was a home win was 1989, which was revenge for 8-0 and 7-2 hammerings in the same season. What on earth happened to Aberdeen yesterday? The Dons looked like the real deal just a couple of weeks back when they rolled Hearts over at Tynecastle to make it eight league wins on the spin. But Derek McInnes's men have since lost three consecutive games and St Johnstone ripped them apart, banging in five goals at Pittodrie. At the other end of the table, Dundee United dropped to last place as Partick Thistle finally found their shooting boots and picked up their first win of the season. Will that hasten the search for a new gaffer at Tannadice? "We know it'll be difficult, Celtic are a top team, but we'll approach the game properly and hopefully take something from the game. You've always got to have belief in yourself." "Everyone knows their tasks and this is an opportunity to stake a claim for a place in the team. We are very hungry for three points today and that will put us in a good place after the international break." Celtic's last league outing was a frustrating 0-0 draw at home to Hearts. The champions missed a ton of chances in the first half but then ran out of ideas. "We were disappointed that we didn't score in the Hearts game but if we continue to play at that level we know we're going to hurt people and get results," said manager Ronny Deila on Friday. Hamilton should be in high spirits after battling from behind to win at Kilmarnock last weekend. A few changes for Celtic, with Tyler Blackett and Saidy Janko getting a run in defence, while there is no sign of midfielder Stefan Johansen. It's a familiar line-up for the hosts. Hamilton: McGovern, Gordon, Garcia Tena, Tagliapietra Kurakins, Gillespie, Imrie, Crawford, Kurtaj, Morris. Subs: D'Acol, Sendles-White, Longridge, Docherty, Lyon, Nade, Martin. Celtic: Gordon; Janko, Boyata, Blackett, Izaguirre; Brown, Bitton; Commons, Rogic, Forrest; Griffiths. Subs: Bailly, Ciftci, Armstrong, Mackay-Steven, Lustig, McGregor, Tierney. 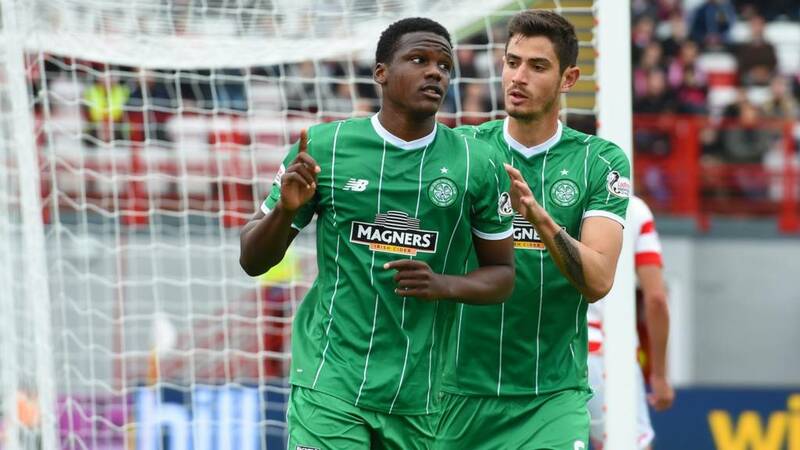 Celtic can close the gap on Premiership leaders Aberdeen to one point with a win today. However, Hamilton Accies will be no pushovers since they have picked up five wins in their opening nine matches and can close to within a point of the visitors if they emerge victorious. Welcome to our Sunday coverage from the action at New Douglas Park.